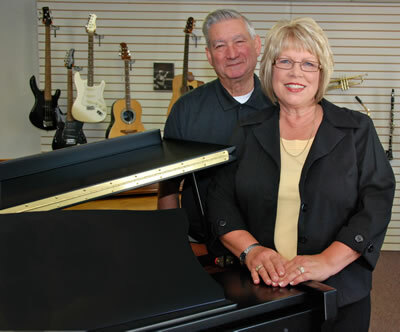 Owners Ken and Debra Ann Kespohl have enjoyed all aspects of music throughout their lives, and enjoy sharing that with students and customers. 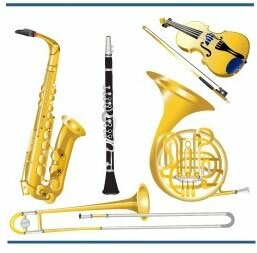 Ann’s Music World is locally owned, and has been serving band and orchestra students and their parents since 1986. Ken Kespohl started his musical career teaching band and orchestra in Kansas City. He also worked part-time in one of the local music stores as an apprentice in the repair shop, where he learned to do instrument repair. Ken moved to Nebraska in the mid-1970s and worked as a route salesman for a local music store. Eventually he purchased the store in 1986. In 1998, upon recommendation from his father-in-law Barney Shives, the main store location was moved to Papillion. “Barney always talked about the friendliness of the people in Papillion and the loyalty they show to local businesses,” Ken said. Ken has played in dance bands and sang in a barbershop men’s chorus for 20 years. He teaches private lessons, makes sales calls to teachers, does instrument repair and performs many other duties related to everyday store business. Ken’s hobbies include spending time in his bass boat fishing, along with golfing, gardening, spending time with family and playing with the newest addition, their goldendoodle puppy, Pogo. Debra Ann Shives Kespohl, the daughter of Barney and Helen Shives, moved with her family to Papillion in 1961. She knew at a very young age that music was something she truly loved and really believes she was born singing. By age 7 Deb began taking piano lessons. She started playing the clarinet when she was 11. Deb attended Papillion-LaVista Public Schools and was very involved in all aspects of music. She participated in band and choir, along with various small groups, ensembles and solo competitions. In 1973 the Papillion High School Band had the opportunity to participate in the International Music Festival in Vienna, Austria. Deb was presented an award for top soloist in the solo competition, and the band was named International Band Champions for which they were awarded the Vienna Cup. Throughout her high school and college years, Deb also worked at her father’s grocery store, the Golden Rule Supermarket, which was located in downtown Papillion. In 1998, upon her Dad’s suggestion, she and Ken decided to move their main store location to Papillion. “It just felt right to open a music store in the town I grew up in,” Deb said. Outside of her business, Deb has several hobbies which include singing in the Acappella Omaha Chorus (four-part women’s harmony), fishing, boating and golfing. She enjoys spending time with her family, which also includes the newest addition, their goldendoodle puppy, Pogo. C.J. Svagera was born and raised in Papillion. He attended Papillion-LaVista Schools and was very involved in the instrumental music program. As a member of the Monarch Marching Band, C.J. had the opportunity to travel to London, where the band received top honors in parade competition. After high school C.J. attended the University of Nebraska-Kearney and the University of Nebraska-Lincoln, where he graduated with a B.A. in music. When not busy at the music store, C.J. enjoys spending time with his family, being active in his church, cooking, gardening and college football.